What's crawling around the floor? Is it a spider, a nano or maybe a larva? HEXBUG is known for ingenious little micro robotic creatures that crawl, climb and even swim. Kids love these little toys because HEXBUG reacts to the world around them. From sounds to light, these little bugs scurry about providing hours of fun playtime. Since St. Patrick's Day brings the luck of the Irish, HEXBUG wants to spread a luck with some green HEXBUGs. Three lucky entrants will be selected for a collection of green HEXBUGs. Do you have the Luck of the Irish? Enter in our HEXBUG giveaway to find out! 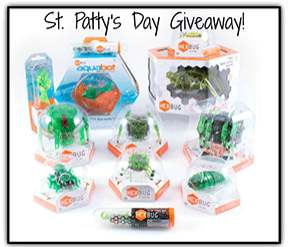 Three lucky leprechauns will be selected for a collection of green HEXBUGs. Included in this prize package is ne of each of the following: Aquabot, Aquabot with Bowl, Scarab, Scarab XL, Spider, Inchworm, Strandbeast, Ant, Original, Larva, Nano, Glow in the Dark Nano. To enter, all you need to do is “like” HEXBUG’s Facebook page. You can also increase your chance of winning by following HEXBUG on Pinterest, Instagram or Twitter. Eligibility is limited to residents of the United States and Canada. Giveaway starts at 3:00 PM CST, March 13, 2014 and ends at 3:00 PM CST, March 17, 2014, so don’t miss your chance to win. I like Hexbug on Facebook. I follow Hexbug on Pinterest. I follow Hexbug on Instagram.